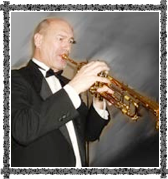 Roger has played with many contemporary and classical groups, including the University of Minnesota’s Symphonic Wind Ensemble directed by Frank Bencriscutto and Craig Kirchoff. 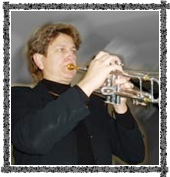 He is a longtime featured soloist with Minnesota Brass and has been a lead trumpeter with local rhythm & blues bands, including The Good The Bad and The Funky. He also plays with Emerson Avenue, the River City Jazz Orchestra, and the Good News Big Band, and co-conducts the Capital City Wind Ensemble. His brass teachers have been Jim tenBensel, Lynn Deichert, and David Baldwin. Here’s his E above Double C.
Tina has played with bands and ensembles at Bemidji and St. Cloud State universities, and the University of Minnesota. She is a longtime soloist with Minnesota Brass and former trumpeter with rhythm & blues bands, including The Good The Bad and The Funky. She has studied with David Baldwin of the U of M, and Lynn Erickson of the St. Paul Chamber Orchestra. She also plays with the Capital City Wind Ensemble, the Shoreview Northern Lights Variety Band, and is a regular sub with the Sheldon Theatre Brass Band. Tina is a freelance biographer. See CavittProductions.com. 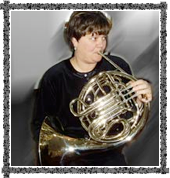 Bea has been principal horn player for the 451st US Army Reserve Band at Fort Snelling for the past 27 years. She was also principal horn at the University of St. Thomas, where she earned her B.A. in Music. Bea is an alumna of the Greater Twin Cities Youth Symphonies, and has spent 14 seasons as a mellophone soloist and brass instructor with Minnesota Brass. She still plays mellophone with Minne-Brass, a 20-member mini-corps. You can hear her on a few CDs around town. Her horn mentors have been Larry Barnhart and Bruce Rardin. Merle holds a B.A. degree in Music Education from Bethel University. His M.A. in the same subject is from the University of St. Thomas. “Mr. D” is a retired music educator, having taught at St. Joseph’s School in West St. Paul, where band participation expanded from 8 students to more than 200 during his 37-year tenure. He completed 27 years of distinguished service with the 451st US Army Reserve Band as principal trombonist, drum major, and associate conductor. Merle is currently music director of the Shoreview Northern Lights Variety Band. 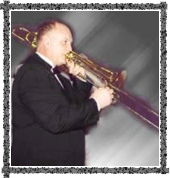 Jerry is an alumnus of the Interlochen National Music Camp, the Greater Twin Cities Youth Symphonies, and the Minnesota Youth Symphony, and was a longtime member of Minnesota Brass. 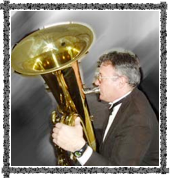 He has studied tuba with Ross Tolbert of the Minnesota Orchestra. He now plays with Minne-Brass and the Shoreview Northern Lights Variety Band. Jerry is also the father of a 25-year-old multi-instrumentalist.